The alleged Samsung Galaxy A80 smartphone with model number SM-A805F has been spotted on Geekbench with key specs. 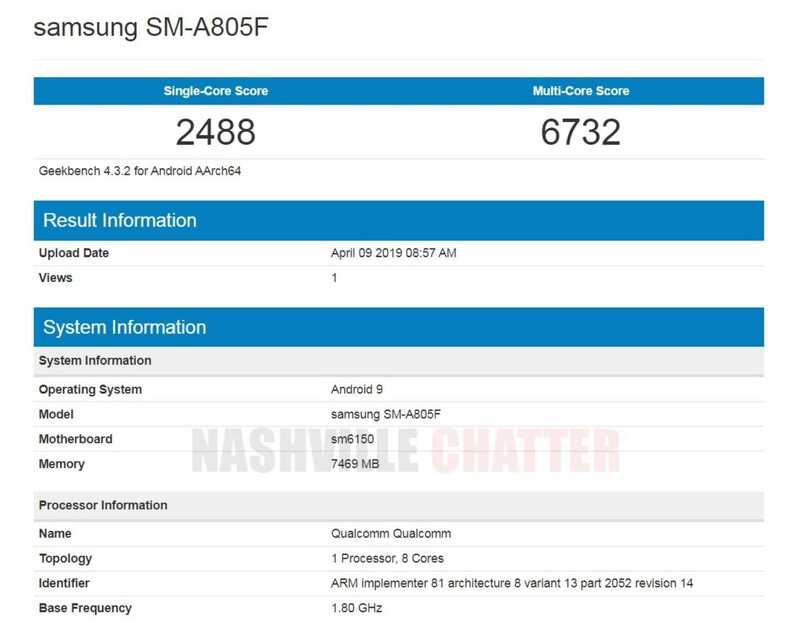 The Samsung Galaxy A80 Geekbench listing reveals that it is fueled by Snapdragon 6150 SoC which is nothing but the Snapdragon 675. It includes 8 GB of RAM. The smartphone runs on Android 9 Pie OS like all the recent Galaxy A-series phones from the company. The Android OS on the device could be overlaid with Samsung’s One UI. In the single-core test of Geekbench, the Galaxy A80 has scored 2,488 points. In the multi-score test, it has recorded a score of 6732 points. There is some confusion regarding the identity of the smartphone. Max. J, who is known for leaking reliable information on Samsung phones, has claimed that the SM-A805F smartphone will indeed hit the market as Galaxy A80. As the name goes, the smartphone will be positioned higher the Galaxy A70 smartphone that is fueled by the Snapdragon 670 SoC. The South Korean company is also working on a higher phone called the Galaxy A90. The smartphone is expected to arrive with a notch-less AMOLED display that will offer full HD+ resolution of 1080 x 2400 pixels. It will be measuring 75.6 x 165 mm x 9 mm and it weighs 219 grams. It is speculated to be powered by the unannounced Snapdragon 7150 SoC that may debut as Snapdragon 755. The phone is expected to carry support for 25W fast charging. The USP of the phone is that it will be equipped with a slider mechanism that will house 48-megapixel + 8-megapixel + ToF rotatory triple camera setup. It won’t be featuring dedicated selfie snappers. However, the triple cameras will be rotate to capture high resolution selfie shots. Samsung Galaxy A80 could be unveiled during the launch event to be held tomorrow, on April 10.